The country code for France is 33. To dial a French number, dial your long distance number and then 33. There are five regional prefixes in France. Along the French Riviera, local land lines begin with a 04. If dialing from abroad, dial 33 4 and then the other eight digits. If dialing from within France or within the region, dial the 0. There are also numbers that begin with 09 which indicate that the call is handled by the Internet Service Provider. The procedure is the same: from abroad you dial 33 9 and then the other digits. Within France, dial 09. Calling from a cellphone will entail extra charges tacked on by the cellphone operator. Cellphone numbers in France begin with 06 or 07. France is a 'caller pays' system but the amount that the caller pays depends on the recipient's cellphone plan. See more on cellphones. 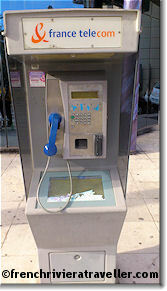 The few public telephone booths that remain use a card, not coins and it's one of the cheapest ways to phone home. If you don't buy a prepaid calling card before leaving home, you can always pick one up on arrival as they are on sale in any tabac, post office or France Telecom office. You can still use the public phones without a card. For example, it's free to make an emergency call. You can also call collect or put the cost on your credit card by dialing *808. It is pricey. How to use a telephone card? Pick up the phone. Insert the card. Dial the number. The screen in front indicates how many units are left on the card.